Japan?s beleagueredspace probe Hayabusa, which may or may not have collected samples of anasteroid, fired up its engine Wednesday to resume its trip back to Earth. After morethan a year coasting through space, Hayabusa reignited its ion-poweredengine to begin the second leg of what has become anextra-long trek home from the asteroid Itokawa, said officials with the JapaneseAerospace Exploration Agency (JAXA). ?We arecontinuing to pay careful attention to our onboard equipment and are doing ourutmost to operate the Hayabusa with the greatest care,? JAXA officials said ina mission update. Thespacecraft is expected to return in June 2010 to deliver a sample canister thatwill plunge through the atmosphere and land on Earth. 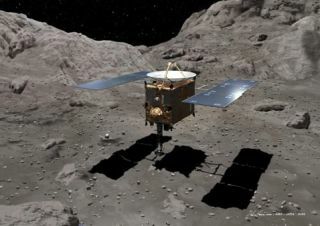 Hayabusa would be thefirst spacecraft to return samples from an asteroid, though past NASAprobes have collected samples from a comet and solar wind. Hayabusa hadbeen flying in a silent coast mode since April 2007, when it officially began the180 million mile (290 million km) trip home from Itokawa. The spacecraftarrived at Itokawa in 2005, but suffered a series of glitches and malfunctionsthat left flight controllers unsure whether it actually managed tocollect a sample of the asteroid?s surface. Hayabusaalso lost a smaller probe, dubbed Minerva, which was supposed to hop aroundItokawa?s surface and take close-up pictures. The probe wassuccessfully deployed, but drifted off the asteroid?s surface soon after, JAXAofficials said at the time. While practicelanding attempts were plagued by glitches, Hayabusa did eventuallytouch down on the potato-shaped asteroid. The spacecraft also photographed the asteroid throughout its mission. Hayabusalost two of its three attitude-controlling gyroscopes during flight, with asubsequent fuel leak and communications issues forcing mission managers to delay its return by threeyears to June 2010. Since itslaunch in May 2003, Hayabusa?s ion engine has operated for about 31,000 hours. Ionengines accelerate spacecraft slowly by using electricity generated bysolar arrays to charge a stream of xenon gas. The resulting charged particles,or ions, are then shot out a nozzle to generate thrust over time. The methodallows spacecraft to fly farther with less fuel. NASA is using an ion drive onits Dawn spacecraft, a probe that is en route to be the first to visit twoasteroids - Vesta and Ceres - in a single mission. JAXAofficials said Hayabusa will continue to fire its ion drive until about March2010, after which its trajectory will be refined for the planned June 2010capsule return.